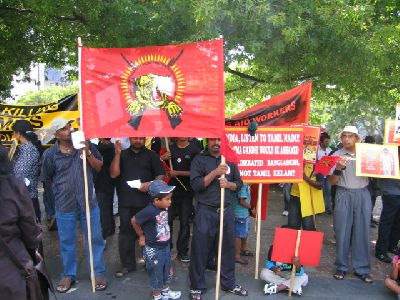 Sri Lanka's Liberation Tigers of Tamil Elam (Tamil Tigers) are listed as a terrorist organisation in many western countries-but not New Zealand. While nationalist in propaganda, the LTTE are basically just one more third world marxist "liberation movement." If there was any doubt that the Tamil Tigers are backed by Marxist-Leninists, this Indymedia report of the February 4th rally in Auckland should settle the question. Note the prominent LTTE flag. Note the desecration of the Sri Lankan flag. Why does the New Zealand media not call these people to account for their blatant lies and disinformation about Sri Lanka-a country that is supposedly a friend? From Cameron of the Indonesian Human Rights Committee. 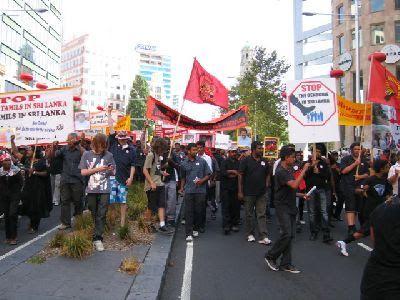 The 4th of February Auckland’s Tamil community held a demonstration against the Sri Lankan Army’s (SLA) massive onslaught on the North of Sri Lanka. The 4th of February is Sri Lanka’s Independence Day...The Sri Lankan government has declared this to be the ‘final assault’ on the LTTE, with no possibility of peace talks or a negotiated settlement. When I arrived at Aotea Square just after 3pm I was surprised to see that a crowd of 200-300 people, mostly Tamil, had already gathered. The march wasn’t scheduled to start until 5pm. I commented to my Tamil friend Anne about the size of the crowd and she said “if they don’t turn up today they would never turn up. It’s that bad”. I asked if the situation in Sri Lanka was a bit like Gaza in the jungle and she answered that it was very similar. I detected similar passion, anger and sadness among the Tamil crowd as I had among the Palestinians on the march against Israel’s assault on Gaza a few weeks earlier. One demonstrator held a large sign reading ‘Gaza and Sri Lanka are on the same planet. UN can’t you see us?’. Members of the Tamil Youth Organisation distributed a book of harrowing testimonies of Auckland Tamils about the killings of family members in Sri Lanka by the SLA. Plenty of stickers and pamphlets were also handed to passers-by. After a brief sit down and moment of silence at the bottom of Queen Street the crowd turned around and made its way back up to Aotea Square for a rally. At the square a young Tamil man introduced the speakers in the Tamil language, followed by translations into English of the introductions by Nirupa from the Tamil Youth Organisation. The first speaker was Kafeba Mundele, a Congolese man who has been active in supporting refugees living in Auckland. Drawing on his personal experiences and the long standing opression of poor people in Africa, Mr Mundele said that it is “hard to be a slave in your own country” and hard to sleep while bombs were dropping. He emphasised that we all have to continue speaking out as long as the Tamil people are abused and denied freedom. Well known activist John Minto, from Global Peace and Justice Auckland, denounced the assault on Tamil communities and the silence of New Zealand’s National led government on the conflict. Maire Leadbeater, from the Indonesia Human Rights Committee, said that this was “a very dark time for Sri Lanka” and also condemned the silence of the NZ government on injustices happening around the World. Maire said that her group strongly supports the right of all people to self determination, whether they be West Papuans suffering under Indonesian Military control or the Tamil people in Sri Lanka. Joe Carolan from Socialist Aotearoa angrily reflected that Sri Lanka’s official name is ‘The Democratic Socialist Republic of Sri Lanka’. “That should be torn down” because socialism is “about working people coming together, no matter whether they are Protestant or Catholic or Sinhalese or Tamils” he declared. The oppression of Tamils by Sinhalese racists removed any right Sri Lanka had to call itself ‘socialist’. As an active trade unionist he apologised on behalf of the New Zealand trade union movement because trade union leaders had been slow to take up the issue of the conflict in Sri Lanka. Joe received a massive cheer from the crowd when he declared his support for the “Tamil liberation movement, the LTTE”. Patrick Brown, from the Communist League, said that Sri Lanka’s fight for independence from the British was a struggle that united both Sinhalese and Tamils and was an inspiration to people around the World. He commented that the “New Zealand government’s silence” on the killing in Sri Lanka “speaks volumes”. Both Labour and National governments happily sign up to the US ‘war on terror’ and thus do not care about the plight of people around the World being terrorised in the name of ‘anti-terrorism’, such as the Tamils. The rally ended with speeches by Dr Rasalingham and Mr Sundarajan from the Tamil community. Dr Rasalingham spoke in both Tamil and English condemning Sri Lanka’s assault on the country’s North and stressed that we must never stop lobbying against abuses committed against the Tamil people. Mr Sundarajan gave a stirring speech declaring that Tamils would “never surrender” in their fight for an independent homeland. Woohoo! Another website publishes my articles and photos! Trevor, did Maire denounce the LTTE and (any of) their actions, and call for peace and an end to violence? This is a serious question by the way, I'm an IHRC member, and I want to know what is spoken in the name of a group I'm a member of. I can assure you George that Maire has never voiced support for the LTTE. Her speech at this event consisted of calling for a ceasefire, NZ to speak out against the conflict and for self-determination for the Tamils.